Appropriately enough with the Tour de France wending its way through France en route for the Champs-Élysées on Saturday 24th, Bastille Day this Friday and the French women’s football team knocking us out of the World Cup at the now-traditional quarter-final stage, it is Paris in July month, hosted by Karen at Bookbath and Tamara at Thyme for Tea. If you are not already participating, I do recommend you pop over to see what is going on. But, zut alors! With my usual lack of organisation, I failed to contribute anything during the first week of July. 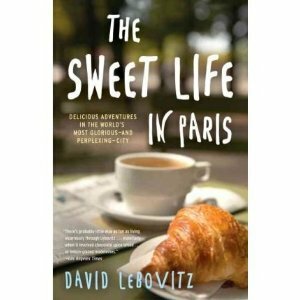 I do intend to remedy that sad state of affairs this week, however, starting with The Sweet Life in Paris by David Lebovitz. David Lebovitz is an American pastry chef, a long time chef-patissier at Chez Panisse in Berkeley, California. In 2004, he moved to Paris, from where he writes and runs his own blog. The Sweet Life in Paris is his sixth book but the first non-recipe book. In the book, he tells the story of his move to France and how he became accustomed to a very different way of life to that of San Francisco, where he had been living previously. There are a number of recipes, for both sweet and savoury dishes at the end of each chapter. I have to say that these are very inviting and I am definitely going to be trying some of them, especially as he thoughtfully includes both US and European measurements in most of them. Lebovitz’ writing style is fluid, self-deprecating and witty. As someone who has worked in Paris and spent a lot of time there over recent years, some of his observations on Parisian life are bitingly accurate and his comments on a couple of Parisian restaurants that I have visited ring several bells. If you are a foodie, you are likely to become quite jealous of his life, even though he tries very hard to dispel the image that he spends his life wandering around Paris sampling delicious products before either cooking gourmet meals or dining at swanky restaurants. The structure of the book is very interesting: each chapter is very short and it is easy to see the influence that food blogging has had on his writing. In fact, one could almost see the book as a collection of lengthy blog posts. This has both its good and bad aspects. On the one hand, it makes the book a good “dipper” as you can read a little, put it down and then pick it up again without worry. The writing is quite informal and so is an easy read. On the other hand, it is all a little bit disjointed and does read like a collection of short pieces rather than a coherent body. Not a real issue for me but I could see some people finding that annoying. It’s also a little bit “surface”. In an effort to be humorous and engaging, Lebovitz doesn’t really delve very deeply into things. The chapter on his experience with the French health service is a case in point: he could easily have introduced a little more thought without sacrificing the readability but doesn’t do so. I appreciate that he is trying to entertain but I found that, even for a light, humorous book, it was a bit unsatisfying. I also have one quite serious niggle. Lebovitz actually doesn’t seem to like quite a lot of things about living in Paris. There’s a sense of cognitive dissonance in the way chapter after chapter he criticises Parisians and Paris whilst continually protesting that he loves the place and the people. Well, a lot of the time you could have fooled me. Overall, this is a light, easy read. If you are a foodie or you dream of living in Paris, you’ll enjoy it, although I would also direct you to Julia Childs’ My Life in France, some of MFK Fisher’s books or On Rue Tatin by Susan Loomis for more substantial “foodie in France” fare. The Sweet Life in Paris was a bit like a nice Madeleine – light, sweet but pretty insubstantial. Mind you, I would happily eat a tray of David Lebovitz’ lemon glazed madeleines (recipe in the book)! Albeit I don't really like France in general, some of their food is excellent, so I'll probably definitely read this book (I'll at least get some restaurant recommendations).